Somatic-cell nuclear transfer, known as SCNT, can also be used to create embryos for research or therapeutic purposes. The most likely purpose for this is to produce embryos for use in stem cell research. This process is also called "research cloning" or "therapeutic cloning". The goal is not to create cloned human beings (called "reproductive cloning"), but rather to harvest stem cells that can be used to study human development and to potentially treat disease. While a clonal human blastocyst has been created, stem cell lines are yet to be isolated from a clonal source. 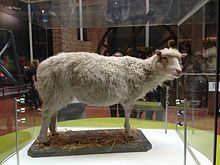 The first mammalian cloning (resulting in Dolly the sheep) had a success rate of 29 embryos per 277 fertilized eggs, which produced three lambs at birth, one of which lived. In a bovine experiment involving 70 cloned calves, one-third of the calves died young. The first successfully cloned horse, Prometea, took 814 attempts. Notably, although the first[clarification needed] clones were frogs, no adult cloned frog has yet been produced from a somatic adult nucleus donor cell. Macaque monkey: (2017) First successful cloning of a primate species using nuclear transfer, with the birth of two live clones, named Zhong Zhong and Hua Hua. Conducted in China in 2017, and reported in January 2018. In January 2019, scientists in China reported the creation of five identical cloned gene-edited monkeys, using the same cloning technique that was used with Zhong Zhong and Hua Hua – the first ever cloned monkeys - and Dolly the sheep, and the same gene-editing Crispr-Cas9 technique allegedly used by He Jiankui in creating the first ever gene-modified human babies Lulu and Nana. The monkey clones were made in order to study several medical diseases. Two commonly discussed types of theoretical human cloning are therapeutic cloning and reproductive cloning. Therapeutic cloning would involve cloning cells from a human for use in medicine and transplants, and is an active area of research, but is not in medical practice anywhere in the world, as of 2014[update]. Two common methods of therapeutic cloning that are being researched are somatic-cell nuclear transfer and, more recently, pluripotent stem cell induction. Reproductive cloning would involve making an entire cloned human, instead of just specific cells or tissues. After the death of her beloved 14-year old Coton de Tulear named Samantha in late 2017, Barbra Streisand announced that she had cloned the dog, and was now "waiting for [the two cloned pups] to get older so [she] can see if they have [Samantha's] brown eyes and her seriousness". The operation cost $50,000 through the pet cloning company ViaGen. ^ American Association for the Advancement of Science (1903). Science. Moses King. pp. 502–. Retrieved 8 October 2010. ^ "Tasmanian bush could be oldest living organism". Discovery Channel. Archived from the original on 23 July 2006. Retrieved 2008-05-07. ^ "Ibiza's Monster Marine Plant". Ibiza Spotlight. Archived from the original on 26 December 2007. Retrieved 2008-05-07. ^ DeWoody, J.; Rowe, C.A. ; Hipkins, V.D. ; Mock, K.E. (2008). ""Pando" Lives: Molecular Genetic Evidence of a Giant Aspen Clone in Central Utah". Western North American Naturalist. 68 (4): 493–497. doi:10.3398/1527-0904-68.4.493. ^ Mock, K.E. ; Rowe, C.A. ; Hooten, M.B. ; Dewoody, J.; Hipkins, V.D. (2008). "Blackwell Publishing Ltd Clonal dynamics in western North American aspen (Populus tremuloides)". U.S. Department of Agriculture, Oxford, UK : Blackwell Publishing Ltd. p. 17. Retrieved 5 December 2013. ^ Peter J. Russel (2005). iGenetics: A Molecular Approach. San Francisco, California, United States of America: Pearson Education. ISBN 978-0-8053-4665-7. ^ McFarland, Douglas (2000). "Preparation of pure cell cultures by cloning". Methods in Cell Science. 22 (1): 63–66. doi:10.1023/A:1009838416621. PMID 10650336. ^ Gil, Gideon (17 January 2008). "California biotech says it cloned a human embryo, but no stem cells produced". Boston Globe. ^ a b Halim, N. (September 2002). "Extensive new study shows abnormalities in cloned animals". Massachusetts institute of technology. Retrieved 31 October 2011. ^ Plus, M. (2011). "Fetal development". Nlm.nih.gov. Retrieved 31 October 2011. ^ a b c d e f g Latham, K. E. (2005). "Early and delayed aspects of nuclear reprogramming during cloning" (PDF). Biology of the Cell. pp. 97, 119–132. Archived from the original (PDF) on 2 August 2014. ^ Campbell KH, McWhir J, Ritchie WA, Wilmut I (March 1996). 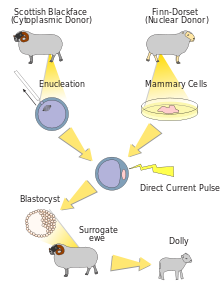 "Sheep cloned by nuclear transfer from a cultured cell line". Nature. 380 (6569): 64–6. doi:10.1038/380064a0. PMID 8598906. ^ Zastrow, Mark (8 February 2016). "Inside the cloning factory that creates 500 new animals a day". New Scientist. Retrieved 23 February 2016. ^ "Asexual Propagation". Aggie-horticulture.tamu.edu. Retrieved 4 August 2010. ^ Perrier, X.; De Langhe, E.; Donohue, M.; Lentfer, C.; Vrydaghs, L.; Bakry, F.; Carreel, F.; Hippolyte, I.; Horry, J. -P.; Jenny, C.; Lebot, V.; Risterucci, A. -M.; Tomekpe, K.; Doutrelepont, H.; Ball, T.; Manwaring, J.; De Maret, P.; Denham, T. (2011). "Multidisciplinary perspectives on banana (Musa spp.) domestication" (PDF). Proceedings of the National Academy of Sciences. 108 (28): 11311–11318. doi:10.1073/pnas.1102001108. PMC 3136277. PMID 21730145. Archived from the original (PDF) on 4 July 2013. ^ "Cloning Fact Sheet". Human Genome Project Information. Archived from the original on 2 May 2013. Retrieved 25 October 2011. ^ Rantala, Milgram, M., Arthur (1999). Cloning: For and Against. Chicago, Illinois: Carus Publishing Company. p. 1. ISBN 978-0-8126-9375-1. ^ Swedin, Eric. "Cloning". CredoReference. Retrieved 23 September 2013. ^ Lassen, J.; Gjerris, M.; Sandøe, P. (2005). "After Dolly—Ethical limits to the use of biotechnology on farm animals". Theriogenology. 65 (5): 992–1004. doi:10.1016/j.theriogenology.2005.09.012. PMID 16253321. ^ Swedin, Eric. "Cloning". CredoReference. Science in the Contemporary World. Retrieved 23 September 2013. ^ Gurdon J (April 1962). "Adult frogs derived from the nuclei of single somatic cells". Dev. Biol. 4 (2): 256–73. doi:10.1016/0012-1606(62)90043-x. PMID 13903027. ^ a b c Wakayama S, Kohda T, Obokata H, Tokoro M, Li C, Terashita Y, Mizutani E, Nguyen VT, Kishigami S, Ishino F, Wakayama T (7 March 2013). "Successful serial recloning in the mouse over multiple generations". Cell Stem Cell. 12 (3): 293–7. doi:10.1016/j.stem.2013.01.005. PMID 23472871. ^ "ThinkQuest". Archived from the original on 23 October 2012. Retrieved 3 May 2015. ^ "Robert W. Briggs". National Academies Press. Retrieved 1 December 2012. ^ a b "Bloodlines timeline". PBS.org. ^ "Gene Genie | BBC World Service". Bbc.co.uk. 1 May 2000. Retrieved 4 August 2010. ^ McLaren A (2000). "Cloning: pathways to a pluripotent future". Science. 288 (5472): 1775–80. doi:10.1126/science.288.5472.1775. PMID 10877698. ^ CNN. Researchers clone monkey by splitting embryo 2000-01-13. Retrieved 2008-08-05. ^ Dean Irvine (19 November 2007). "You, again: Are we getting closer to cloning humans? - CNN.com". Edition.cnn.com. Retrieved 4 August 2010. ^ Grisham, Julie (April 2000). "Pigs cloned for first time". Nature Biotechnology. 18 (4): 365. doi:10.1038/74335. ^ "First cloned endangered species dies 2 days after birth". CNN. 12 January 2001. Retrieved 30 April 2010. ^ "Americas | Pet kitten cloned for Christmas". BBC News. 23 December 2004. Retrieved 4 August 2010. ^ "Rat called Ralph is latest clone". BBC News. 25 September 2003. Retrieved 30 April 2010. ^ Associated Press 25 August 2009 (25 August 2009). "Gordon Woods dies at 57; Veterinary scientist helped create first cloned mule". latimes.com. Retrieved 4 August 2010. ^ "World's first cloned horse is born – 06 August 2003". New Scientist. Retrieved 4 August 2010. ^ "First Dog Clone". News.nationalgeographic.com. Retrieved 4 August 2010. ^ Sinha, Kounteya (13 February 2009). "India clones world's first buffalo". The Times of India. Retrieved 4 August 2010. ^ Note: The Pyrenean ibex is an extinct sub-species; the broader species, the Spanish ibex, is thriving. Peter Maas. Pyrenean Ibex – Capra pyrenaica pyrenaica Archived 27 June 2012 at the Wayback Machine at The Sixth Extinction]. Last updated 15 April 2012. ^ Spencer, Richard (14 April 2009). "World's first cloned camel unveiled in Dubai". London: Telegraph.co.uk. Retrieved 15 April 2009. ^ Ishfaq-ul-Hassan (15 March 2012). "India gets its second cloned animal Noorie, a pashmina goat". Kashmir, India: DNA. ^ Hickman, L. (18 March 2013). "Scientists clone extinct frog – Jurassic Park here we come?". The Guardian. Retrieved 10 July 2016. ^ Normile, Dennis (24 January 2018). "These monkey twins are the first primate clones made by the method that developed Dolly". Science. doi:10.1126/science.aa1066 (inactive 7 March 2019). Retrieved 24 January 2018. ^ Science China Press (23 January 2019). "Gene-edited disease monkeys cloned in China". EurekAlert!. Retrieved 24 January 2019. ^ Mandelbaum, Ryan F. (23 January 2019). "China's Latest Cloned-Monkey Experiment Is an Ethical Mess". Gizmodo. Retrieved 24 January 2019. ^ Martinez, Bobby (26 January 2018). "WATCH: Scientists clone monkeys using technique that created Dolly the sheep". Fox61. fox61. Retrieved 26 January 2018. ^ a b Kfoury, C (July 2007). "Therapeutic cloning: promises and issues". Mcgill J Med. 10 (2): 112–20. PMC 2323472. PMID 18523539. ^ "Cloning Fact Sheet". U.S. Department of Energy Genome Program. 11 May 2009. Archived from the original on 2 May 2013. ^ de Grey, Aubrey; Rae, Michael (September 2007). Ending Aging: The Rejuvenation Breakthroughs that Could Reverse Human Aging in Our Lifetime. New York, NY: St. Martin's Press, 416 pp. ISBN 0-312-36706-6. ^ "AAAS Statement on Human Cloning". ^ McGee, G. (October 2011). "Primer on Ethics and Human Cloning". American Institute of Biological Sciences. Archived from the original on 23 February 2013. ^ "Universal Declaration on the Human Genome and Human Rights". UNESCO. 11 November 1997. Retrieved 27 February 2008. ^ McGee, Glenn (2000). 'The Perfect Baby: Parenthood in the New World of Cloning and Genetics.' Lanham: Rowman & Littlefield. ^ Havstad JC (2010). "Human reproductive cloning: a conflict of liberties". Bioethics. 24 (2): 71–7. doi:10.1111/j.1467-8519.2008.00692.x. PMID 19076121. ^ Watanabe, S (September 2013). "Effect of calf death loss on cloned cattle herd derived from somatic cell nuclear transfer: clones with congenital defects would be removed by the death loss". Animal Science Journal. 84 (9): 631–8. doi:10.1111/asj.12087. PMID 23829575. ^ "FDA says cloned animals are OK to eat". NBCNews.com. Associated Press. 28 December 2006. ^ "An HSUS Report: Welfare Issues with Genetic Engineering and Cloning of Farm Animals" (PDF). Humane Society of the United States. ^ Hansen, Michael (27 April 2007). "Comments of Consumers Union to US Food and Drug Administration on Docket No. 2003N-0573, Draft Animal Cloning Risk Assessment" (PDF). Consumers Union. ^ a b Holt, W. V., Pickard, A. R., & Prather, R. S. (2004) Wildlife conservation and reproductive cloning. Reproduction, 126. ^ Ehrenfeld, David (2006). "Transgenics and Vertebrate Cloning as Tools for Species Conservation". Conservation Biology. 20 (3): 723–732. doi:10.1111/j.1523-1739.2006.00399.x. PMID 16909565. ^ Ono T, Li C, Mizutani E, Terashita Y, Yamagata K, Wakayama T (December 2010). "Inhibition of class IIb histone deacetylase significantly improves cloning efficiency in mice". Biol. Reprod. 83 (6): 929–37. doi:10.1095/biolreprod.110.085282. PMID 20686182. ^ Baer, Drake (8 September 2015). "This Korean lab has nearly perfected dog cloning, and that's just the start". Tech Insider, Innovation. Retrieved 27 February 2016. ^ Ferris Jabr for Scientific American. 11 March 2013. Will cloning ever saved endangered species? ^ Heidi B. Perlman (8 October 2000). "Scientists Close on Extinct Cloning". The Washington Post. Associated Press. ^ Pence, Gregory E. (2005). Cloning After Dolly: Who's Still Afraid?. Rowman & Littlefield. ISBN 978-0-7425-3408-7. ^ Holloway, Grant (28 May 2002). "Cloning to revive extinct species". CNN.com. ^ "Researchers revive plan to clone the Tassie tiger". The Sydney Morning Herald. 15 May 2005. Retrieved 1 February 2019. ^ Gray, Richard; Dobson, Roger (31 January 2009). "Extinct ibex is resurrected by cloning". The Telegraph. London. Retrieved 1 February 2009. ^ "Scientists 'to clone mammoth'". BBC News. 18 August 2003. ^ "BBC News". Bbc.co.uk. 7 December 2011. Retrieved 19 August 2012. ^ Yong, Ed (15 March 2013). "Resurrecting the Extinct Frog with a Stomach for a Womb". National Geographic. Retrieved 15 March 2013. ^ "Long Now Foundation, Revive and Restore Project". 25 May 2017. ^ "Generations of Cloned Mice With Normal Lifespans Created: 25th Generation and Counting". Science Daily. 7 March 2013. Retrieved 8 March 2013. ^ Carey, Nessa (2012). The Epigenetics Revolution. London, UK: Icon Books Ltd. pp. 149–150. ISBN 978-184831-347-7. ^ "TIME Magazine – U.S. Edition – Vol. 142 No. 19". 8 November 1993. Archived from the original on 5 November 2017. Retrieved 5 November 2017. ^ "Today The Sheep…". Newsweek. 9 March 1997. Retrieved 5 November 2017. ^ Huxley, Aldous; "Brave New World and Brave New World Revisited"; p. 19; HarperPerennial, 2005. ^ Bhelkar, Ratnakar D. (2009). Science Fiction: Fantasy and Reality. Atlantic Publishers & Dist. p. 58. ISBN 9788126910366. Retrieved 4 November 2017. ^ Stableford, Brian M. (2006). "Clone". Science Fact and Science Fiction: An Encyclopedia. Taylor & Francis. pp. 91–92. ISBN 9780415974608. ^ planktonrules (17 December 1973). "Sleeper (1973)". IMDb. Retrieved 3 May 2015. ^ Muir, John Kenneth (2007). A Critical History of Doctor Who on Television. McFarland. pp. 258–9. ISBN 9781476604541. Retrieved 4 November 2017. ^ Mumford, James (2013). Ethics at the Beginning of Life: A Phenomenological Critique. OUP Oxford. p. 108. ISBN 978-0199673964. Retrieved 6 November 2017. ^ Humber, James M.; Almeder, Robert (1998). Human Cloning. Springer Science & Business Media. p. 10. ISBN 9781592592050. Retrieved 6 November 2017. ^ "Twice as nice: Barbra Streisand cloned her beloved dog and has 2 new pups". CBC News. Retrieved 1 March 2018. ^ Hopkins, Patrick (1998). "How Popular media represent cloning as an ethical problem" (PDF). The Hastings Center Report. 28 (2): 6–13. doi:10.2307/3527566. JSTOR 3527566. PMID 9589288. ^ "Yvonne A. De La Cruz Science Fiction Storytelling and Identity: Seeing the Human Through Android Eyes" (PDF). Retrieved 19 August 2012. ^ "Uma Thurman, Rhys Ifans and Tom Wilkinson star in two plays for BBC Two" (Press release). BBC. 19 June 2008. Retrieved 9 September 2008. ^ "Review of Bunshin". 9 June 2012. ^ foreverbounds. "Orphan Black (TV Series 2013– )". IMDb. Retrieved 3 May 2015. ^ Banville, John (10 October 2004). "'The Double': The Tears of a Clone". The New York Times. Retrieved 14 January 2015. ^ Christian Lee Pyle (CLPyle) (12 October 1978). "The Boys from Brazil (1978)". IMDb. Retrieved 3 May 2015. ^ Cohen, Daniel (2002). Cloning. Millbrook Press. ISBN 9780761328025. Retrieved 4 November 2017. ^ Thompson, Dave (2013). Doctor Who FAQ: All That's Left to Know About the Most Famous Time Lord in the Universe. Hal Leonard Corporation. ISBN 9781480342958. Retrieved 4 November 2017. ^ Barr, Jason; Mustachio, Camille D. G. (2014). The Language of Doctor Who: From Shakespeare to Alien Tongues. Rowman & Littlefield. p. 219. ISBN 9781442234819. Retrieved 5 November 2017. ^ McDonald, Paul F. (2013). "The Clones". The Star Wars Heresies: Interpreting the Themes, Symbols and Philosophies of Episodes I, II and III. McFarland. pp. 167–171. ISBN 9780786471812. Retrieved 4 November 2017. ^ compel_bast (15 August 2008). "Star Wars: The Clone Wars (2008)". IMDb. Retrieved 3 May 2015. ^ espenshade55 (11 February 2011). "Never Let Me Go (2010)". IMDb. Retrieved 3 May 2015. ^ "The Island (2005)". IMDb. 22 July 2005. Retrieved 3 May 2015. ^ larry-411 (17 July 2009). "Moon (2009)". IMDb. Retrieved 3 May 2015. ^ "Technology News – 2017 Innovations and Future Tech". This page was last edited on 9 April 2019, at 17:10 (UTC).